In this lesson we will see how to write a custom function that combines several literal strings with random words chosen from three lists to create an insult. 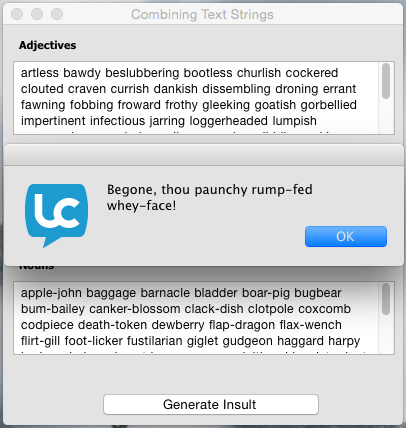 Note: The words list for this insult generator has been floating around the Internet for years. The original source is unknown. The function chooses three words, two adjectives and a noun, from three lists of words. The any keyword selects a random word from each list. For this lesson we need a stack containing 3 fields, holding our lists of words and a button to generate an insult. 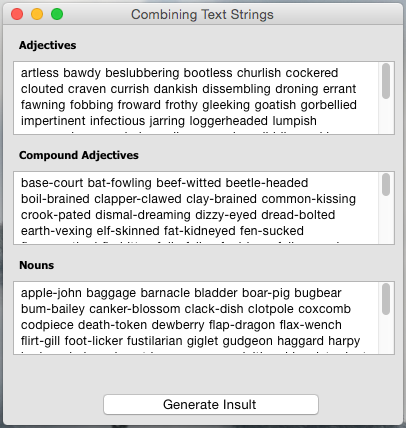 We will use the any keyword to select a word from each list when generating the insult. The any keyword designates a randomly chosen member of a set. We will place the shakespeareanInsult() function on the card script, this gives the script direct access to the 3 fields as they are controls on the card. To generate the insult we combine the string "Begone, thou" with a randomly chosen word from each string using the && operator. The && operator combines 2 strings and inserts a space between them. && any word of field "nouns" & "!" Now all we need to do is call the function from out button and use the answer command to display the result in an answer dialog. && any word of the cNouns of me & "!" We can use the keyword me as it refers to the object whose script contains the handler that is executing. In this case, me refers to the card.